Twitter responds to Ivanka Trump's ‘Why I Disagree With My Dad’ cover by meme-ing her into oblivion. Ivanka Trump's face is on the cover of Us Weekly for a face-saving profile in which "sources" claim that she will "always fight for what she believes in," as she works in the White House while her father Donald Trump dismantles civil rights and environmental protections. 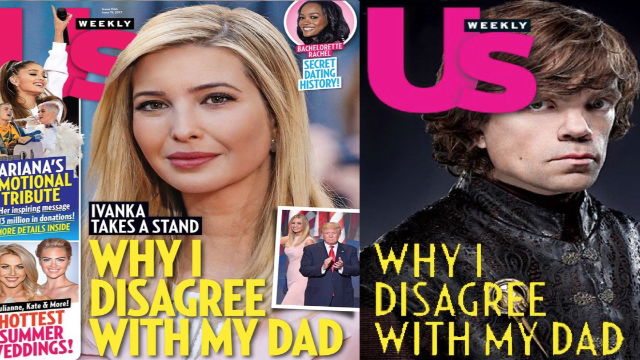 Now it's a meme, people taking the headline and applying it to pop culture's best kids with sh*tty dads, who'd get the same treatment if they only had an in at Us Weekly like Ivanka does. Daddy issues span from Sci Fi to the great works of literature. And it got real, real dark. This meme shall reign supreme...until Donald Trump's next spelling mistake on Twitter.